Surrey County Council are building a new 19 million pound office within the Gatwick Diamond, where we have provided bespoke framing solutions. The Gatwick Diamond is home to over 45,000 businesses with London Gatwick Airport at its heart. Its boundary runs from London in the North, to Brighton in the South, Guildford in the West to Royal Tonbridge Wells in the East. Click here for further details and to see a map showing the Gatwick Diamond. Within its boundary are the UK headquarters of many global brands including ExxonMobil, Unilever, Nestle, Elekta and Doosan. Surrey County Council is developing a brownfield site within the Gatwick Diamond with a 19 million pound four story office situated near Crawley. This is due for completion in September and has been pre-let by South East Coast Ambulance Service. The council believe this approach is a blueprint for others to follow in using land assets to provide long-term revenue streams that off-set cuts in other funding sources. We are currently supplying the Mechanical and Electrical contractors undertaking the first and second fix installations for all aspects of the HVAC, pipework, plumbing and electrical requirements for this office development. 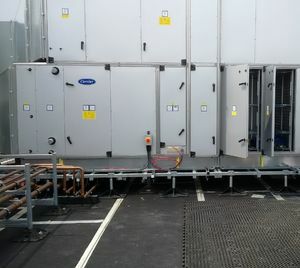 In particular we have provided a bespoke roof top solution for supporting 6 Air Handling Units, 3 Chiller Units and a 20,500Kg Plant Room. The frames were bespoke designed in partnership with Pump House Support Systems using the Flexi-Heavy and Flexi-Quad framing systems. Other roof support items included Fixmart H-Frame sets and Fixmart Fix-it Feet. Click here to view our selection of support systems.